Visa-free travel allows nationals of one country to visit another for tourist or business purposes without having to complete lengthy visa application procedures. Visa-free travel agreements demonstrate close ties between the two nations that are involved, and a continued commitment to each other as allies and economic partners. For this reason, St Kitts and Nevis has made a number of significant steps towards reinstating visa-free travel for its people to Canada. As of June 27 Citizens of Antigua and Barbuda will require visas to travel to Canada . Chief of Staff Lionel “Max” Hurst has confirmed. A statement from the Communications Branch for Immigration, Refugees and Citizenship, Canada confirms the visa requirement takes effect from tomorrow. Monday, June 26, 2017— Canada and Antigua and Barbuda share longstanding ties that are rooted in history. Canada remains firmly committed to its partnership with Antigua and Barbuda and values working together on mutual challenges and opportunities. After carefully monitoring the integrity of Antigua and Barbuda’s travel documents, the Government of Canada has determined that Antigua and Barbuda no longer meets Canada’s criteria for a visa exemption. As of 5:30 a.m. EDT June 27, 2017, citizens from Antigua and Barbuda will need a visa to travel to Canada. At that time, any existing electronic travel authorization (eTA) issued to an Antigua and Barbuda passport holder will no longer be valid and these travellers will not be able to use their eTA to travel to Canada. The Government of Canada is sending emails to all affected eTA holders to inform them that their eTAs are no longer valid and that they will need a visa to travel to Canada. Canada continues to welcome visitors from Antigua and Barbuda. Most approved visa applicants will receive a multiple-entry visa, which allows travellers to visit Canada as many times as they want, for up to 10 years. For each visit, travellers can stay for up to six months. Travellers with questions or concerns should take note of the following. During the first 48 hours after the imposition, or until 5:29 a.m. June 29, the Government of Canada will be working closely with airlines to help facilitate travel for those who are already in transit to Canada. To help speed up visa processing, citizens who are in Antigua and Barbuda and who have already booked a flight to Canada, departing on or before July 11, can send their complete visa application, along with proof that they purchased their flight before June 27, the appropriate fees and supporting documents, directly to the Visa Office in Port of Spain, Trinidad and Tobago, for priority processing. If they go in person before noon, their application will be processed that day. If they send via courier, their application will be processed within 24 hours. Note that while these applicants will receive priority processing, they are not guaranteed a visa by their travel date and may need to make alternative travel arrangements. Antiguan and Barbudan citizens can apply online for a visa as of 5:30 a.m. June 27, or submit a paper application in person or by mail to any Visa Application Centre. The Visa Application Centre in Port of Spain, Trinidad and Tobago, is the closest one to Antigua and Barbuda. Most applications (about 80 percent) are processed within 14 days. Note that having pre-booked travel plans or a previously valid eTA does not guarantee that a traveller will be issued a visa. SKN Prime Minister Dr. Timothy Harris-Prime Minister of Canada Justin Trudeau and Minister of Foreign Affairs and Deputy Premeir of Nevis Hon. 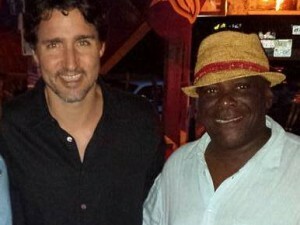 Mark Brantley during Trudeau’s recent visit to St.Kitts-Nevis. St.Kitts-Nevis Officials have been actively engaging thier Canadian counterparts in efforts to have Visa-Free waiver for SKN Passport Holders to Canada, reinstated. In 2014, Kittitians and Nevisians lost the right to travel to Canada. However, Foreign Affairs Minister Dr. Hon. Mark Brantley, the concerns that drove that decision on the part of the Canadian Government should no longer apply. Specifically, Minister Brantley cited changes in the political climate, both in Canada and in St Kitts and Nevis, which would ease talks about travel and international inclusiveness. Discussions between the Governments of St Kitts and Nevis and Canada are predicted to increase ,particularly after the recent establishment of a permanent home for the High Commission of St.Kitts-Nevis in Canada. The Canadian government representative Honourable Matt Decourcey conveyed that the St Kitts and Nevis presence in Ottawa was a sign of confidence in and respect for the relationship. He offered hope for a new era in the partnership for more active and direct bilateral engagement through the High Commission. It is these continued recent enhancements in the relationship between the two countries which signals to all the optimism of a re-establishment of visa-free waivers for St.Kitts-Nevis citizens travelling to Canada.